FORMER Oasis star Noel Gallagher is set to marry publicist Sara MacDonald at the lavish Lime Wood Hotel in the New Forest today . The couple – who have two children together – have been an item since meeting at Space nightclub, Ibiza, 11 years ago. They arrived at the venue shortly after 1pm yesterday in a silver Mercedes people carrier with blacked-out side windows. Noel, whose hits include Don’t Look Back in Anger and Wonderwall, could be seen sitting in the front of the vehicle, nervously biting his nails. They are thought to have paid £60,000 to secure exclusive use of the 29-room hotel for yesterday, today and tomorrow. Security was tight as smartly dressed guards were called in to man the gate at the end of a quarter of a mile long driveway leading to the venue. Pop singer Katy Perry and her husband Russell Brand are expected to be among the guests but Noel’s brother Liam is unlikely to attend. Noel, 44, had said he hoped Liam would attend even though they have reportedly not spoken since a bust-up before a Paris concert in August 2009. 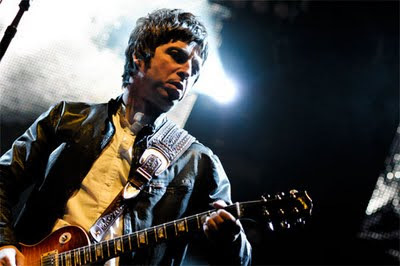 But he is currently touring the United States with his new band Beady Eye and is due to play in Chicago on the same day as the wedding.